Born and raised in the Pacific Northwest, angling has been a major part of my life from the beginning. My dad was a certified steelhead junkie and my youth was spent plying local waters for willing players. I am now the owner and operator of Harris Anglers, and partners with Tom Larimer of Larimer Outfitters. I am a full-time, year-round fishing guide, which has been my dream from childhood. My guide career began in 1999 on the famed waters of the upperKenai on Alaska’s Kenai Peninsula. 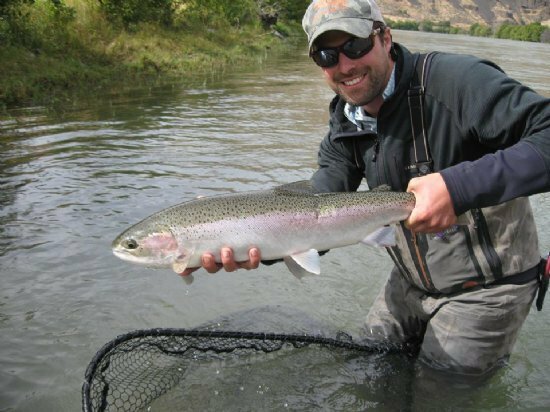 I spent 16 productive years on the Kenai chasing some of the biggest, most aggressive rainbow trout in the world. During this time I pursued other guiding opportunities in the off-season, which in 2002 led me to the Deschutes River where I guided for four seasons in the Maupin area. In 2009 I started Harris Anglers and began my own business, fishing my home waters of theSandy and Clackamas, and severalnorthern Oregon coastal rivers. Recently, In 2015 I partnered with Tom Larimer of Larimer Outfitters and returned to the Deschutes running single day and multi-day camp trips on the lower Deschutes. At present, I spend July through early November running a jet boat on the lower Deschutes running steelhead spey camps, and January through April running drift boat trips for winter/spring steelhead around Portland and the North Oregon Coast. I am very passionate about sharing my knowledge and experience with my guests and believe that fishing is about more than just catching fish. I truly welcome all skill levels and embrace the opportunity to either introduce someone to the sport or hunt with a seasoned veteran.